Below is going to read like doom and gloom on how AI and robotics will change so much of our jobs, our personal lives, and the modern enterprise. It's not. But it is a brass-tacks perspective on technologies that will bring incredible disruption to the “white collar” industry, to society and to us as individuals. With the breakthroughs in robotics and AI, in blockchain and the industry of distributed connectivity around the internet of things (IoT), we face an incredible, transformative and somewhat scary future. But we also see a future that offers the opportunity to increase the quality of life and health of society. We cannot avoid the fact that the “white collar” industries – financial services, legal, consulting, audit, administration, management and many other functions – will, over the next decade, face significant increases in productivity, with resulting declines in labor force size, job security, and individual skills value, while simultaneously experiencing an increased demand for workforce retraining and a focus on the individual as an entrepreneur. In other words, we should be prepared to experience a complete realignment of the work/life balance that we have become used to over the last 50 years. Sectors of our economy have endured such transformation already – manufacturing, mining and telecommunications – and some (like media, retail shopping and distribution) are going through it today. We can look to them for what went well and what didn’t, where deployment failed and succeeded and what new operating models and opportunities could be created. We also need to look to societies abroad that are much better prepared than the U.S. for the societal impact of this revolution in productivity and automation. As I take up the mantle of a new role, multiple technologies are presenting themselves as genuinely transformational. And some really are this time. I believe for the first time in many years we have enterprise technologies that are as exciting, and offer the FS industry as much opportunity as innovations in consumer and social media did over the last decade: the “cognitive enterprise” with broad augmented and artificial intelligence deployments revolutionizing decision making, pricing, negotiating, risk, compliance and workflow management; the trust and consistency that Blockchain brings customer, transaction and financial supply chain interactions; the productivity revolution of the robotic back office and the digitization of huge numbers of traditionally manual functions; and the “information yield” revolution that AI offers data management. We’ve heard these monikers being bantered around a lot – artificial or augmented intelligence (AI), artificial neural networks (ANN), machine learning (ML), robotics and robotic process automation (RPA), and blockchain. What’s more, breakthroughs in natural language processing (NLP) can finally address unstructured data and paperwork challenges and of course the IoT’s increasing sprawl and resulting distributed computing and analytics connecting and accessing almost everything in our lives. There exists genuine, transformational promise in these trends in which value can be monetized and justified clearly in the business case. Not “big data’s” nebulous, always hopeful promise, but real, understandable bottom-line impact with defined and focused use cases offering a measurable financial impact. Many have spoken about these technologies and the opportunity they present – in value, in productivity, in quality of the supply chain and processes, and in cost efficiency. I am in complete agreement that these technologies will add multiple basis points to the bottom line of a financial institution. Their contributions, however, will not emerge solely from the creation of a new Alpha, new competitive products or customer solutions. Rather, the impact will be heavily felt in the middle and back offices, in the administrative work and manual paperwork that currently support the creation of competitiveness and value. We should expect a wholesale cost of operations reduction with the use of these new, disruptive technologies. COIN at JPMorgan is an excellent example of the huge impact that semantic natural learning processing can achieve in short order. The impact of such projects on traditional paper-based activities – loans, contracts, LCs, audit – will be significantly greater than the impressive impact JPMC realized with COIN. Mastercard is experimenting with chat-bots to transform the cost and speed of the call center, which if successful will disrupt not just customer service but administrative support in general. As Siri-like tools grow in capability, the digital assistant or digital consultant is growing in momentum as a real alternative to their human counterpart. The data center and traditional physical technology locations are being broken up by the cloud. In financial services, Amazon AWS has quietly grown larger in FS than the next several cloud providers combined and they are close to a clear lead in systemically important financial institutions and utilities. “Bundling” will also bring huge disintermediation challenges to traditional banks with one out of five consumers saying they would bank with search and social media providers. Not a single white collar function should be considered sacred – venture capital, personalized wealth management and retail brokerage, insurance, foreign exchange, global custody, derivatives and all other functions are now fair game for new cognitive and robotic innovations. Some say that more programmers and designers will be needed. This is true, but for each one that is added another 15 will be lost. Technologists, given the enormous expense that the IT department has grown to over the last two decades, should be far from complacent when self-modifying code and AI code creation breakthroughs are growing every day. In IT management as well, AI is having major performance and reaction time impact in Gartner's newly minted Algorithmic IT Operations or AIOps category. What this means is genuinely worrying as a human being, yet, as a technologist incredibly exciting. Excellent references that reconcile these two emotions and are worth reading include: the “Four Fundamentals of Workforce Automation” from McKinsey in which they estimate that 45 percent of current activities individuals are paid to perform can be automated by adapting currently demonstrated technologies. That equates to over $2 trillion in U.S. annual salaries! ; Also, the recent New York Times editorial by Kai-Fu Lee, chairman and chief executive of Sinovation Ventures, points to a troubling continuation of wealth polarization as owners and shareholders reap the benefits of automated and cognitive productivity, forcing labor into significantly more subservient and poorly paid positions. So, we should recognize a near future where enterprise shareholder value increases while the size and cost of labor within the FS enterprise sharply decreases. Margin growth over the next decade will come from huge cost reallocation and decline in operations and technology expense, and not necessarily from direct new business, new products or Alpha creation. Much like blue-collar industries already have been disrupted by technological innovation in the past, white-collar industries face exactly the same disruption over the next decade. There will likely be an increasing polarization of wealth, decreasing job security, black spots of unemployment and a higher unemployment rate within society in general. Such economic challenges are not created by immigrants or external forces: they are created by capital’s increasing demand for return, a return that will always have productivity as a foundational component. As such, return will always be higher as technology innovation automates activities and functions and, as a result, reduces manual labor and time costs. In the enterprise, the key focal point for success or failure will be the technical knowledge level of the C-suite and the board of directors. The financial services digital revolution will not come from overzealous architects or excitable systems integrators. It will come from transformative decisions from the top. Decisions that will have major balance sheet impact. Cultural and operating DNA changes will be needed with new innovations, and a clear understanding of their applicability will be critical for future enterprise leadership. One could speculate that with the increase in automation and its associated predictability, transparency of risk, compliance and regulatory reporting, financial institutions could well become more robust and much more capital efficient. One could even argue that the next wave of technology innovation will remove the fears of "too big to fail" as human error, malfeasance and incentive driven poor decisions are removed. Then again a critical failure in a mission critical system offers similar and perhaps more dangerous challenges. In business models and go-to-market strategy, agility and rapid reinvention will be key attributes of success. West Coast development cultures – experiment, fail fast, recalibrate quickly – will become even more critical in technology enabled competition. Effectively understood and articulated business requirements will also be key – simply writing them and having them interpreted will lead to many more failures or delays. The need of a common, consistent and clear vernacular between business and IT teams will be even more fundamental in a market where every activity has the potential to be digitally accelerated. As individuals we need to expect the “gig economy” – a labor market characterized by the prevalence of short-term contracts or freelance work as opposed to permanent jobs – will become business as usual, and that competitive development and activities like Mechanical Turk, human creative roles like marketing and micro-financed entrepreneurship will become highly common. 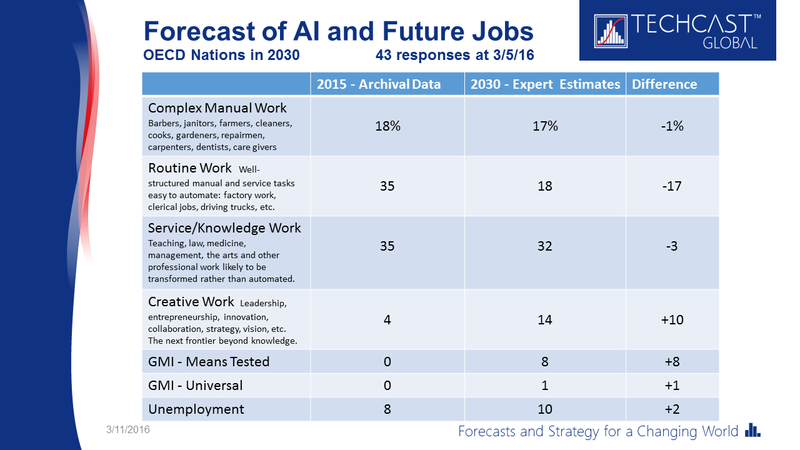 The OECD forecasts that such creative jobs will increase over 10 points by 2030. But we will need to be more agile, learn new skills and take more risks. And most importantly, we need to recognize that the job for life is done once and for all..
Also personally, we will see an opportunity to find a new balance in our lives – more leisure time, more time with families, more projects and hobbies. We should look to Scandinavia, Germany, Italy and other continental European countries to see how they balance life with work. It will be difficult for the American psyche, but ultimately, it will be very healthy for society. Also at the same time population growth in technologically advanced Western societies is slowing, and a smaller labor force will naturally be the result, buffering the effect of increased automation technologies. On a larger national scale, in federal and state budgets, there must be a priority focus on mass retraining and retooling of individuals, and communities and segments of the industry. Three day workweeks with one day of training is something we should be looking to accommodate. Corporate America as well as state and federal governments must learn from their failures in handling the technology impacts on the labor forces of the Rust Belt, the auto manufacturing cities of the Midwest and the mining communities of Appalachia. One key area is going to be education – how do we change and refocus the way K-12 children are educated so they cannot just manage, but lead, create and thrive in an economy where ideas and businesses will pop up and succeed, mature, change, fail and revive again over months, not the years we expect now? Inevitably as wealth polarization increases, the tax system and social contract will need to change with value being acknowledged and applied to roles and jobs that currently are dismissed or devalued - cooks, gardeners, repairmen, farmers. These were roles that diminished as white collar roles boomed. The trend will reverse over the next 20-30 years. Finally, we should expect some new “cognitive industries” to emerge; cyber security is an early growing area and many more will appear. Will they create full employment just like after other Industrial Revolutions? Possibly, but modern-day Luddism will not stop these changes and their impact from coming. This is not CRM, or Y2K or "Big Data" – projects forced on the enterprise to change some degree of strategy or focus and with questionable value. These new innovations are competitively critical and will rock a sizable part of the national GDP to the core, and the very DNA of how we operate as an industry. Winners and losers will be determined quickly. Agility will be a benchmark of success and competitiveness, and successful modern leaders will understand innovation and technology vernacular. Nothing will be sacred or unassailable, skills and wealth polarization will accelerate and we as a society will face some fundamental social and individual questions of who we are and how we work and collaborate together. These technologies will force us to change, to refocus and to create as they mature from being disruptors to catalysts of new ideas and innovations. Before stability arrives, there will be a heady path of disruption, failures, unicorns, losses and breakthroughs. There has never been a more transformational, scary and exciting opportunity for the modern enterprise economy. This blog was orginally published on LinkedIn. Simon Moss is the vice president of Industry Consulting and Solutions for The Americas at Teradata. Responsible for consulting, solutions and services across industrial, healthcare, retail, auto and transportation, financial services and telecommunications industries. His team delivers high-performance business analytics and computing, artificial intelligence and machine learning, intelligent process automation, IoT and distributed computing solutions that bring creative but real, demonstrable and rapid business success for clients. Simon was the founder and CEO for Mantas Corporation with responsibility for all market, financial and operational aspects of global strategic growth, marketing and execution functions. He also was founder and CEO of Pneuron Corporation – a Business Orchestration Company in 2010. Simon’s experience includes turning around a hardware-based video communications company, Avistar Communications, becoming one of the top NASDAQ performers of 2009. Other experience includes the founding of the IBM Risk Management Practice, Partner at PWC and involvement on multiple Technology Company Boards of Directors. He was most recently a Managing Director at Grant Thornton responsible for FinTech in the Americas. Technology Enabled Have Billions of Dollars in Organizations, Technology and Regulatory Fines Actually Reduced Money Laundering?